John H. Gibbons was President of Resource Strategies (1998-2015). Other institutional affiliations included the Office of Science and Technology Policy, Executive Office of the President and the University of Tennessee. His research interests included energy policy and atomic physics. January 15, 1929Birth, Harrisonburg (Va.). 1949Obtained BS, Randolph-Macon College, Ashland (Va.). 1954Obtained PhD in Physics, Duke University, Durham (N.C.). 1954 – 1973Physicist and Group Leader, Nuclear Geophysics, Physics Division (1954-1969) and Director, Environmental Program (1969-1973), Oak Ridge National Laboratory, Oak Ridge (Tenn.). 1973 – 1974Director, Federal Office of Energy Conservation. 1974 – 1979Professor of Physics and Director of Energy, Environment and Resources Center, University of Tennessee, Knoxville (Tenn.). 1976 – 1979Member, Advisory Committee, Energy Conservation Programs, National Bureau of Standards. 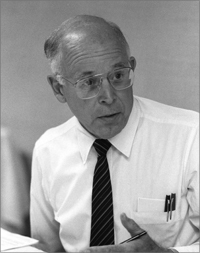 1977 – 1979Chair, Advisory Committee, Energy and Environmental Systems Division, Argonne National Laboratory. 1977 – 1993Chair, Panel on Residential Energy Conservation Assessment (1977-1979) and Director (1979-1993), Office of Technology Assessment, United States Congress, Washington (D.C.). 1978 – 1979Member, Advisory Panel, Division of Policy Research and Analysis, National Science Foundation. 1979 – 1992Member, Energy and Resources Committee, Aspen Institute. 1980 – 1992Member, Senior Advisory Panel, Energy Modeling Forum (1980-1992) and Member, School of Engineering Advisory Council (1984-1989), Stanford University. 1983 – 1992Member, Board of Directors, Resources for the Future, Inc.
1988 – 1990Member, Board of Directors, American Association for the Advancement of Science. 1993 – 1998Director and Assistant to the President for Science and Technology, Office of Science and Technology Policy, Executive Office of the President, Washington (D.C.). 1993 – 2006Member, Government-University-Industry Research Roundtable (1993-1998) and Member, International Advisory Board, Committee on International Programs (2000-2006), National Academy of Sciences. 1994Member, National Academy of Engineering. 1998 – 1999Karl T. Compton Lecturer, Massachusetts Institute of Technology (MIT). 1998 – 2000Member, Steering Committee, National Climate Assessment. 1998 – 2009Council of Advisers, National Renewable Energy Laboratory. 1998 – 2015President, Resource Strategies, Plains (Va.). 1999 – 2000Senior Fellow, National Academy of Engineering. 1999 – 2001Senior Adviser, United States Department of State. 2001 – unknownDivision Adviser, Division on Physical Sciences and Engineering, National Research Council. 2002 – 2015Consultant, Lawrence Livermore National Laboratory. 2003 – 2006Chair, Board of Directors, Population Action International. 2005Fellow, American Academy of Arts and Sciences. 2006 – presentMember, Advisory Board, Scientists and Engineers for America. July 18, 2015Death, Crozet (Va.). Physicist; Group Leader, Nuclear Geophysics, Physics Division; and Director, Environmental Program. Director and Assistant to the President for Science and Technology. University of Tennessee, Knoxville. Energy, Environment, and Resources Center. Chair, Advisory Committee, Energy and Environmental Systems Division. Member, Energy and Resources Committee. Obtained PhD in Physics (1954). Member, International Advisory Board, Committee on International Programs. Member, Advisory Committee, Energy Conservation Programs. Division Adviser, Division on Physical Sciences and Engineering. Obtained BS in Mathematics and Chemistry (1949). Stanford University. School of Engineering. Chair, Panel on Residential Energy Conservation Assessment and Director. John H. Gibbons papers, 1970-1998. This gifted age : science and technology at the millennium / John H. Gibbons ; foreword by Vice President Al Gore. John Howard Gibbons Physics Today obituary.